Do you reminisce about the days of your childhood spent on the beach building sandcastles with mini plastic shovels and a bucket, like I did? Well, Markus Kayser just automated the entire process with the Solar Sinter. Kayser’s innovation harnesses the power of the two most significant elements of the desert, sand and sun to print 3D objects. He further claims that he has the secret for using the sun and sand to provide a nearly unlimited source of silica in the form of quartz, as an energy and building material combination. Kayser spent the first half of 2010 testing his first solar and manually powered machine in the harsh climates of the Egyptian Desert. Outfitted with a large spherical lens, which directs the sun’s rays onto a surface that is moved by a camera-guided system, to melt sand into glass. 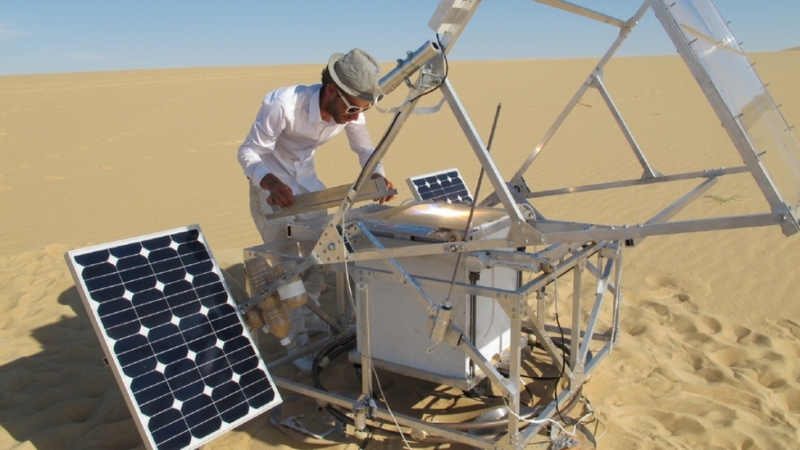 In February 2011, Kayser tested his new and improved solar sintering machine in the Moroccan Desert, which successfully led to the computer driven, fully automated and much larger Solar Sinter, comprised of several distinct components, including a battery, photovoltaic panel, controlling electronics, Fresnel lens to magnify the sun’s rays, a sun tracker and a silver tent dubbed the office, where Kayser could shield himself from the scorching sun and simultaneously monitor the process. During the trial, Kayser hauled the Solar Sinter deep into the desert, and leveraged the abundance of scorching natural energy. The 3D Solar Sinter printer can create any imaginable shape from bowls, furniture to even sculptures. The machine literally transformed the desert into a production facility for any imaginable design in glass. The products are not so much as pretty as they are unique the demonstration in this YouTube video produces a sculpted form and a bowl that have a sort of ant farm like quality to them. Don’t let that mislead you, there’s a huge potential to cheaply build forms and structures in locations that are otherwise extremely resource-poor. A machine that combines the abilities of the Solar Sinter with the mobility of the 3D printer on wheels that I recently wrote about could move across a desert, turning it into what ever form you could wish it to be. Inside the Solar Sinter, the sands of the desert replace conventional resin in the production process and are melted and contoured into whatever shapes are desired. The entire process is a visual treat to say the least, the focused beam of sunlight exuding an amazing glow as beautiful in its own way as the final products themselves. The concept of the Solar Sinter Sand 3D printer is similar in conception to the laser sintering printers used by companies like SpaceX to print highly complex objects out of metal. The difference being that a focused sunbeam, as used by Kayser’s Solar Printer, is a free resource that substitutes remarkably well for a high-energy laser. Kayser is dedicated to exploring the endless possibilities of the desert, and its timeless supply of sand and solar power. As always it is a marvelous thing to potentially be able to put the value in the designs and ideas and have the physical materials be the inexpensive resource in the equation, available to all. Perhaps in the future we will all live in the castles made of sand, of which we dreamed as children. The post 3D Solar Sinter Printer Works With Sand And Sun appeared first on 3D Printing Industry News.